Home to the Pentwater Civic Band, these gifted local musicians gather on the Pentwater Village Green each Thursday night for free concerts in the park. The sprawling lawn, the natural amphitheater of the Green, and a beautiful Pentwater Lake backdrop set the stage for a string of spirited oldies, marches, polkas, and fight songs. 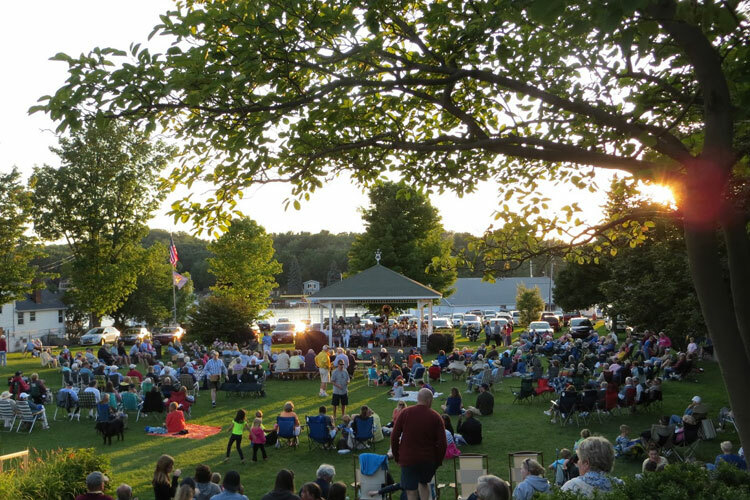 A summer night band concert in the quaint harbor town of Pentwater is simply perfect. Visitors of all ages gather for this old-fashioned fun. Everyone is welcome! Gull Landing, a popular Pentwater restaurant and bar, offers outdoor seating & live music on Sunday nights. The Village Cafe has live music on Friday & Saturday nights, and the Village Pub has regular evening performances.